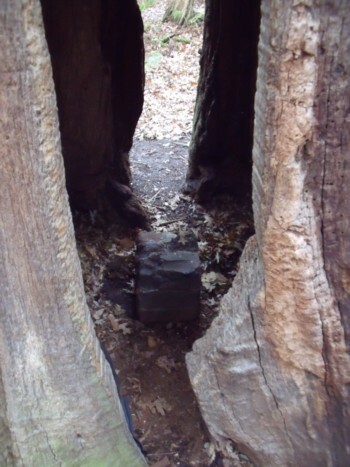 Concrete & Dog-Rubbish inside Ancient Oak Trees in Richmond park | QuantumPhoenix.net – Esoterica, Paganism & Ritual Magic. I was in Richmond park earlier today, doing some photography, as well as some magical work this afternoon.. and I was utterly dismayed to come across some unsavory rubbish – not just in the usual places (in fact no rubbish in the usual places)…but INSIDE some very old Oak Trees! I love ancient oak trees – especially the ones with a hollow central part. Most old Oaks have it.. but if the outside bark is complete..then we never see the hollow inside section. As part of natural wear and tear, parts of the outer bark drops off, and `an opening appears’.. This,over time widens (especially if people and or animals go in and out often and chip bits of the edge off). Those hollow oaks are magical places- sacred temples. I mean, how often does a human get to be inside another living being – after birth? Think about it – we all were inside our mothers’ wombs – and once born, we never can go back.. and we don’t ever get inside another living creature in our lifetime – unless of course, we can step inside a hollow living oak tree! So today, I was exploring and came across one hollow oak – that had large chuck of bricks & concrete block – someone had places inside (possibly as a seat? 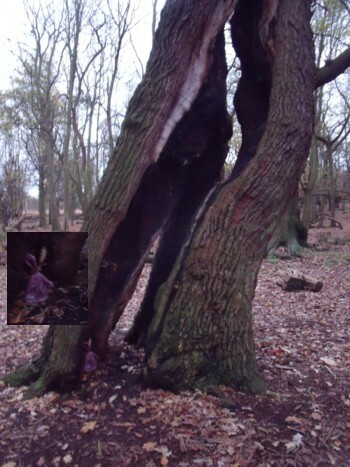 )…and I managed to move it out and chuck it far away from the tree…and later, I found another hollow oak tree with a small plastic bag – of dog excretion! Honestly- people who walk their dogs in these conserved Royal parks.. could easily carry their dog excretion and put it in special bins.. Why just dump in the woods? and why – or why put it inside a hollow oak tree? It’s already very bad to have any sort of carnivore excretion introduced to the Richmond park.. The excretion contains chemicals and substances that are not local to the Richmond park habitat, and it introduces unwanted ecological (bacteria) intruders …which can upset the food chain, cause bugs to grow and even cause diseases to the local wild life such as Deer (300 Re deer and 350 fallow deer live in Richmond). Am not making any of this up. All this information comes from notices in the park itself.